Signature Ice Cream - coming right up! This ice cream is sinful. Not normal. Insanely good. So good, in fact, that it’s topping my leader board and becoming a 365scoops signature flavor. As you all know, it’s birthday week at 365scoops and I’ve had the distinct pleasure of making ice creams for a few of my nearest and dearests! I served this flavor on Sunday at Baby S’s first birthday party and all her cool family and friends loved it. So much so, in fact, that her grandfather told me “In my rolodex, 365scoops is listed as #1 under ice cream.” Hilarious! Not to sound like a moron but who uses a rolodex anymore? Too funny! Needless to say, all the little yentas loved this flavor. In fact, they requested that this become a Signature Flavor for 365scoops. So, your wishes are my command! Behold, the power of salty and sweet! This flavor is perfect for anyone with a brain who loves the combination of salty and sweet. The rich vanilla bean ice cream is a great backdrop for the salty yet sweet caramel swirl (heavenly) and the chunks of chocolate covered potato chips. Coming from someone who usually prefers chocolate-based ice creams, this vanilla bean was so creamy and perfect that you should RUN don’t walk to make this flavor at home. Enjoy! Melt the sugar over medium to moderately high heat in a larger pot than you think you’ll need–at least two quarts, whisking or stirring the sugar as it melts to ensure it heats evenly. Cook the liquefied sugar to a nice copper color. Add the sea salt and butter and stir until the butter melts. Lower the heat and slowly drizzle in the heavy cream, whisking the whole time. The sauce will foam and hiss; just ignore it and whisk until the sauce is smooth. Taste it and if you think it needs more sea salt, grind in a bit more. Set aside until needed. This can be stored in the refrigerator for up to a week, but you’ll be using it all in this outstanding ice cream! In a saucepan heat the half-and-half until small bubbles form around the sides. Set aside. While the mixture is heating, whisk together three egg yolks and sugar in a large heat-proof bowl until the mixture thickens and turns a pale yellow. Temper the eggs by slowly pouring in the heated half-and-half and whisking together. Pour this mixture back into the saucepan, add in the vanilla bean paste and vanilla extract. Heat the mixture until it reaches 175 degrees or is thick enough to coat the back of a wooden spoon. Let cool completely before refrigerating for 1-2 hours. Look at that beautiful salted caramel! Once the ice cream is chilled, pour into the base of an ice cream maker and churn according to the manufacturer’s instructions. Approximately 5 minutes before the mixture is done churning pour in the chocolate covered potato chips (make sure they are pretty good sized chunks). Once done churning you’ll need to assemble the ice cream with the salted caramel swirl. Scoop 2 tbs of caramel on the bottom of the freezer safe container. Layer with a hefty scoop of ice cream. Repeat, until you fill the container, each time digging the spoon to the base of the ice cream and swirly very gently so that the caramel swirls throughout the ice cream. Top with a few extra potato chips for good measure and return to the freezer to harden. When you’re ready to eat it, grab and spoon and dive in straight from the container. No need for a bowl on this one. The Verdict: Considering my peeps said to make this a signature flavor, I think that speaks for itself! In the words of Rachel Ray, Yum-O! Happy Birthday Baby S. I hope you enjoyed it too! To say that I hate bananas is a gross understatement. For those of you who know me, you know that I loathe bananas. I despise bananas. I am utterly repulsed by bananas. They smell. The consistency is disgusting. And the sound they make when people eat them? Uch. Fuggedaboutit. And what’s worse? A rotten banana. Each year for The Husband’s birthday I make him chocolate chip banana bread. It’s a labor of love. I pinch my nose the entire time while baking it, and each time, he calls me a baby. I swear that I am allergic to bananas. In fact, sometimes I tell people that I have a very serious banana allergy just so that I don’t have to explain that I actually dislike bananas. This year, The Husband turned the big 3o. I’ve been prepping myself for this day for years and as his “much younger wife” it’s my duty to remind him, day in and day out, just how old he has become (and just how young I remain!) As a special treat for his birthday I decided to make an outrageous triple-layer chocolate peanut butter cake (it was breathtaking!) with none other than…drumroll please…banana ice cream. Two rotten bananas + two fresh bananas = gross! To make this banana ice cream I used two uber-rotten bananas, and two fresh ones. The combination was perfect, and really mimicked the taste of banana bread. (Or so I’ve been told — this is actually the first ice cream that I have not tasted, so technically I cannot vouch for it’s quality). To further enhance the banana flavor I caramelized the bananas first – and again, I’ve been told by the royal taste-testers that this was well worth it. While I’d love to add my own personal opinion of this ice cream, I will never, ever taste it. Mark my word. You’ll just have to trust The Husband and our friends who ate this ice cream. They seemed to like it, a lot, and I think you will too. Cut the four bananas into small discs. The very ripe bananas will not cut as cleanly, that’s fine, just break into small pieces. Line a baking sheet with parchment paper and place the bananas in it. Sprinkle with brown sugar and chopped butter. Toss well with hands and bake for 35-40 minutes until the bananas get very soft and begin to roast and caramelize. While the bananas are cooking combine the cream, whole milk, and vanilla in a medium saucepan. Whisk until small bubbles begin to form around the edges. Remove from heat and set aside. 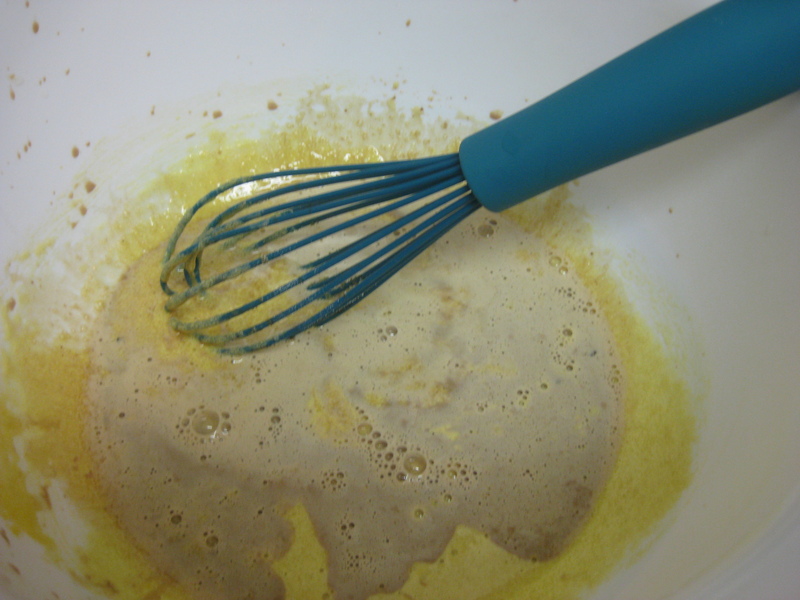 Whisk together the three egg yolks, slowly adding in the white sugar until the egg yolks thicken and become pale yellow. 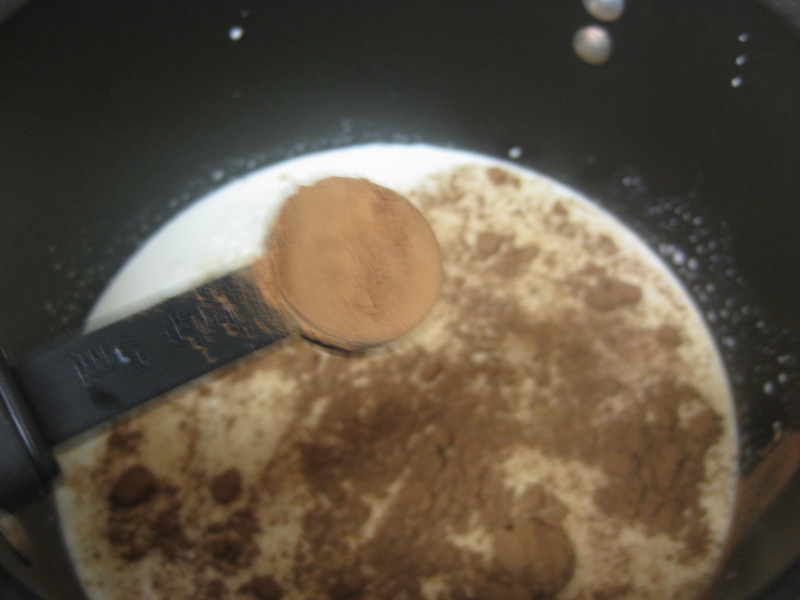 Slowly temper the eggs by pouring the hot milk mixture into the egg mixture, stirring in between each pour. At this point, the bananas should be done roasting. Remove them from the oven and set aside. Pour the egg/milk mixture back into the medium saucepan and heat until it reaches 170 degrees and the eggs are fully cooked. If you don’t have a candy thermometer the mixture is cooked when it is thick enough to coat the back of a spatula or wooden spoon. Next, add the bananas into the milk mixture. Stir thoroughly to break up the small banana pieces. Transfer to a blender and puree until the mixture is smooth. Let the banana ice cream base chill completely before refrigerating for at least two hours. Transfer the fully chilled mixture into the base of an ice cream maker, and churn according to the manufacturer’s instructions, approximately 20 minutes. When it’s done, freeze for at least 2 hours to firm up, or enjoy “soft serve” straight out of the machine. The Verdict: I asked The Husband what to write here – after all, I never tasted this flavor, so how could I know. In his words, “this $hit is bananas, B-A-N-A-N-A-S”. Enjoy! Amen to that. I used to think that I was a morning person. Who the hell am I kidding? I am delusional, irritable and flat out cranky in the morning. Don’t even try talking to me if I haven’t slept the night before. You will regret it. I always thought that when I “grew up” I wouldn’t need sleep as much. Au contraire, mon frère! When left to my own devices on the weekend I can sleep until 1pm. And I do. Regularly. Recently someone asked me to go to the gym at 11am on Sunday. Nope, I’ll still be sleeping. The person looked at me like I had 2 heads. Why is that so hard to comprehend? 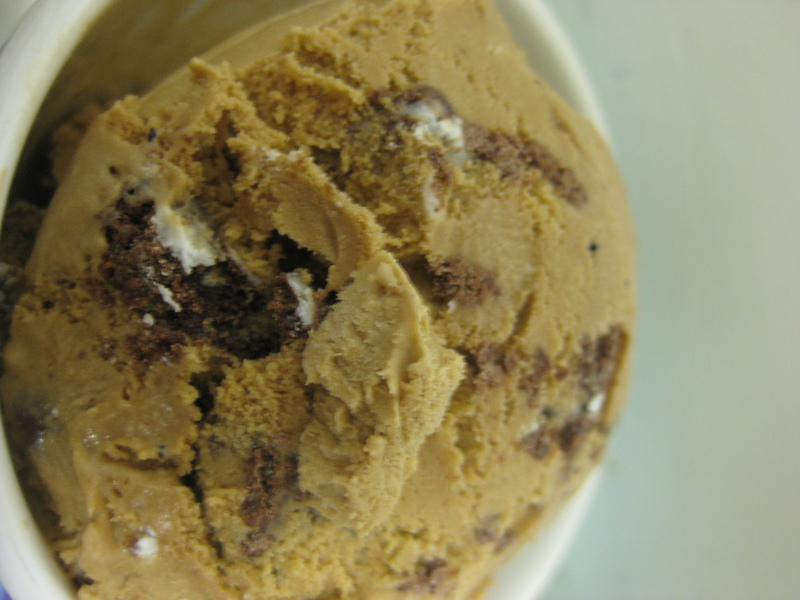 This ice cream flavor pays homage to my favorite flavor ever: coffee oreo at JP Licks. 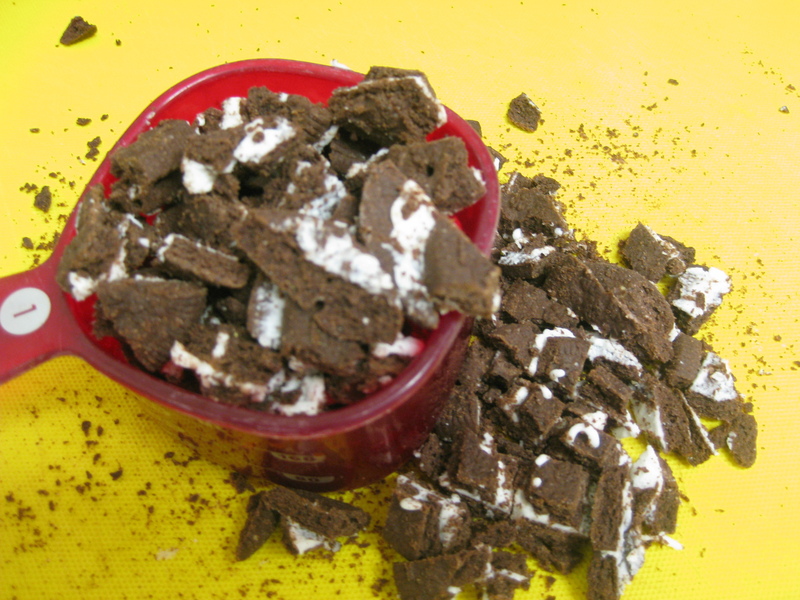 In fact, coffee oreo yogurt was the first flavor I ever made at 365scoops. This time, however, it’s gluten free! 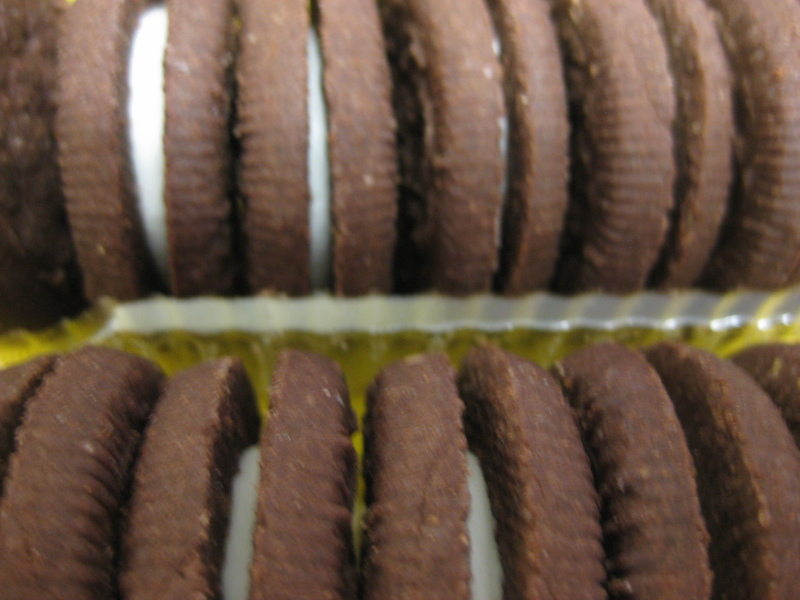 Look at those cute little Oreos! Usually I’m not a fan of imitation anything. Fake sugar, no thanks. Fake cheese, eh. Fake milk, hell no. Up until recently I may have even turned my nose up at “fake” oreos as well. Not this time! I was on a mission to make coffee oreo ice cream as a special treat for my gluten-free best friend. In fact, it’s been one year since she started the G-Free diet and it’s going swimmingly! Coffee Oreo used to be her favorite flavor, but those dang oreos are loaded with so much gluten that she can no longer eat them. Milk, coffee and sugar. Nothing wrong with that! Lucky for me, an awesome store recently opened in my ‘hood called G-Free NYC and as a result, I was able to make this fabulous ice cream treat just for her! In a medium saucepan heat 2 cups of half-and-half, the sugar and the instant coffee until bubbles begin to form around the edges. Remove from heat. 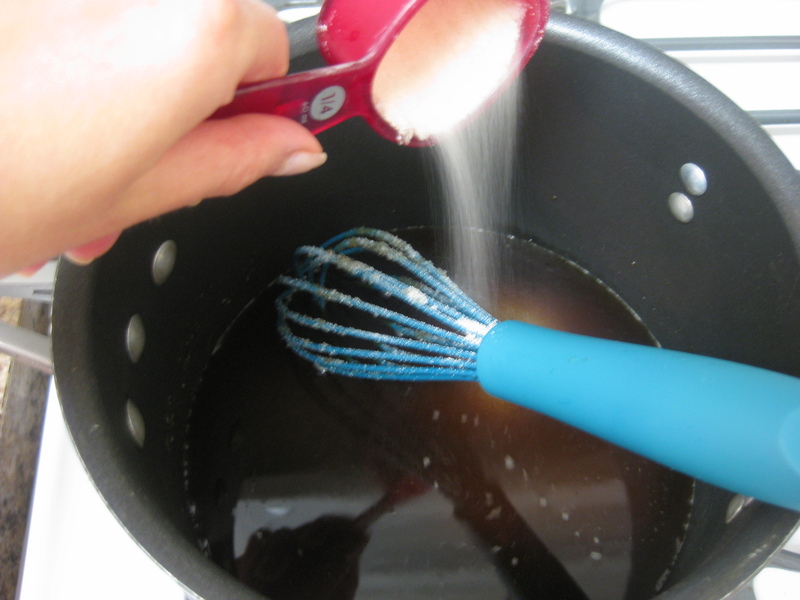 Whisk together the three egg yolks, and slowly pour the coffee+milk mixture over the eggs. Stir well. 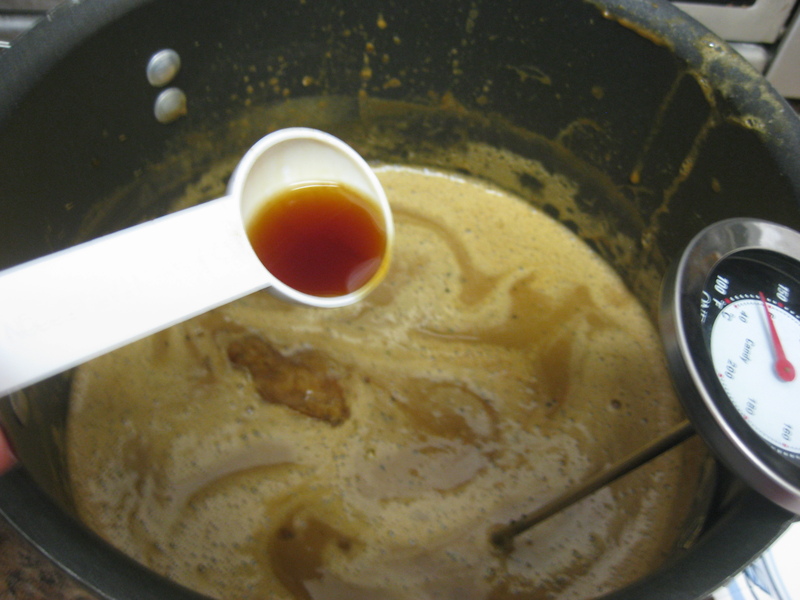 Pour the mixture back into the medium saucepan, add the kahlua, and heat until it reaches 170 degrees F. If you don’t have a thermometer, it should be thick enough to coat the back of a spatula or wooden spoon. Remove from heat immediately and pour into a heat-proof mixing bowl. Add the last cup of half-and-half and the 1/4 tsp of ground coffee and stir well. Cool completely before refrigerating for at least 2 hours. Chopped up and ready to go! 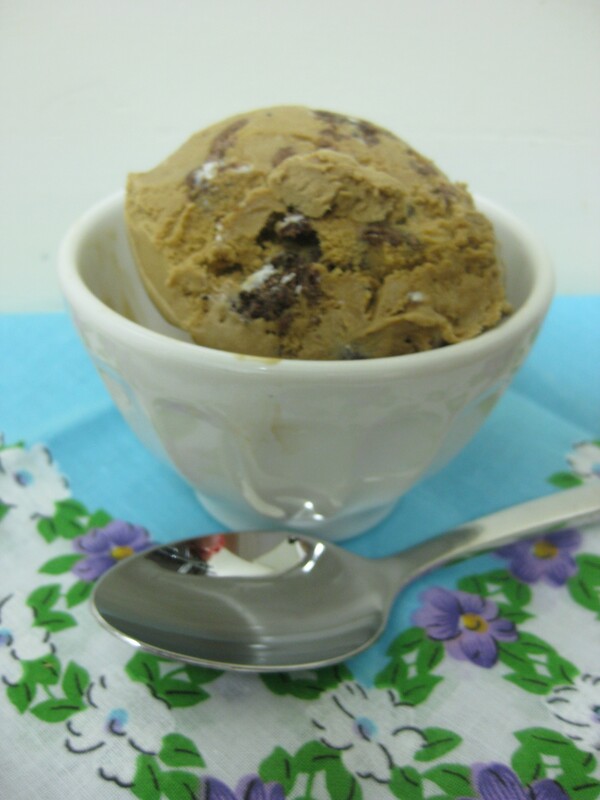 Once ready to churn, pour into the base of an ice cream maker and freeze according to the manufacturer’s instructions. While the ice cream is churning chop 1 1/4 cup Oreos and set aside. Approximately 5 minutes before the mixture is done churning pour in the Oreos and let mix thoroughly. 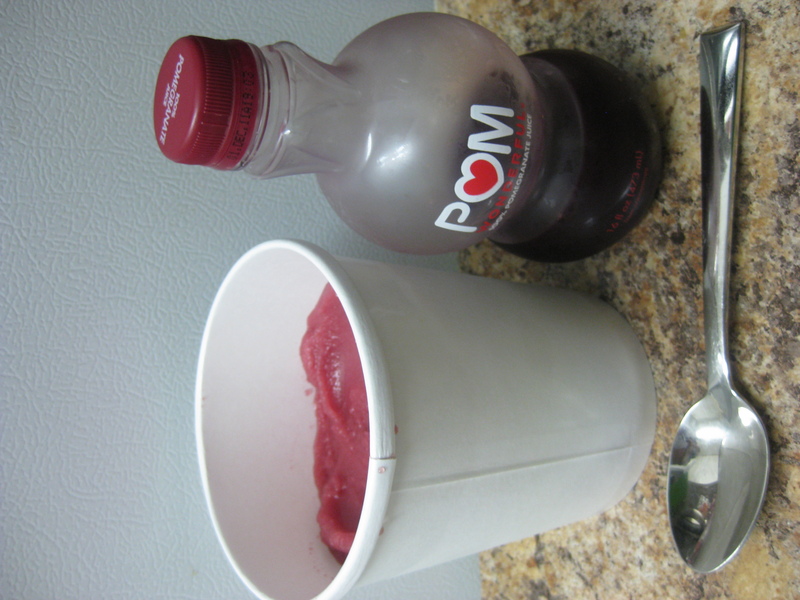 Transfer to a freezer safe container and freeze for 2 hours before enjoying. Up close and personal. Look at those nice oreo chunks! The Verdict: Unbelievable! I don’t want to sound like I’m speaking in hyperboles here, but honestly this stuff is good. Real good. Something about those G-Free Oreos enables them to retain their crunch — and the combination of cookie and oreo is, simply put, delectable! I highly recommend making this flavor, even if you aren’t G-free. 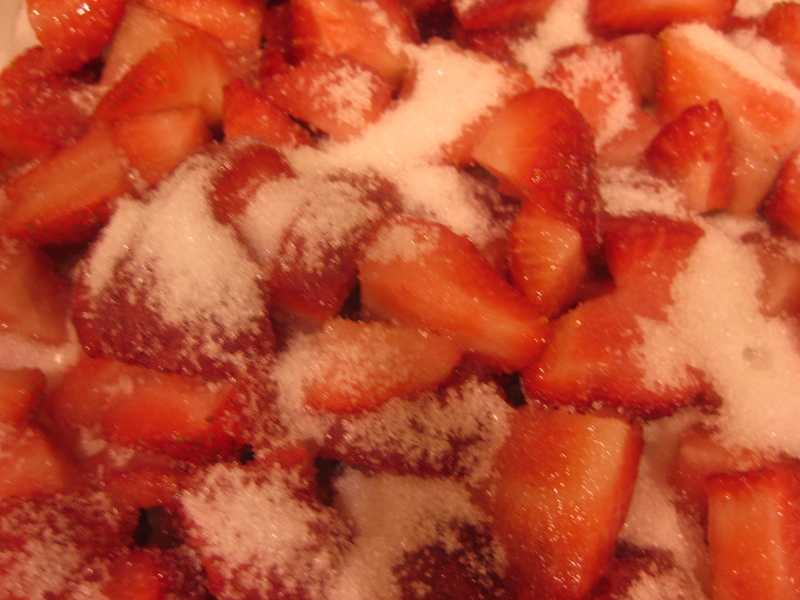 Strawberries and sugar...what could be bad about that? It’s been two months since I had my last eggless ice cream. That sounds like some sort of AA confession. Truth be told, it is. When I first started 365scoops I was making loads of ice cream but was petrified of using eggs. What if I gave someone salmonella? What if I overcooked the eggs and made chocolate scrambled egg ice cream? Tempering eggs seemed way out of my league and Philadelphia-style ice cream suited me just fine. Then one day I decided to start using eggs and to be honest, I haven’t looked back. I never thought I would say this but I absolutely prefer custard. It’s richer, creamier, and allows you to use whole milk/half-and-half instead of heavy cream. Bottom line: I’m addicted to ice creams and gelato made with eggs. Enter Jeni. I’ve been following Jeni’s Splendid Ice Creams since I started this blog and I’ve been waiting with bated breath for her highly-anticipated cookbook to hit the stores. Hearing that she uses cream cheese, corn starch and corn syrup instead of egg yolks, I was intrigued. So, when I saw her new cookbook in Williams Sonoma I knew I had to have it. The next thing I knew, I was at home reading each page of the cookbook, savoring the beautiful photos and drooling over her recipes. David Lebovitz raves about her, and so naturally she must be great. I dove into her book head first and decided to make a good, old fashioned classic: Strawberry Ice Cream. If you like hard-packed ice cream, this is the recipe for you. If not, I say stick to the custards. But, roasting the strawberries, as described below, is a fabulous idea because it releases some of the extra juices and makes the flavor even more intense. Strawberry fields forever. First you’re going to roast the strawberries (note: I don’t have a roast function in my tiny NYC apartment kitchen, so I did bake, and it was just fine). Preheat oven the oven to 375 degrees. 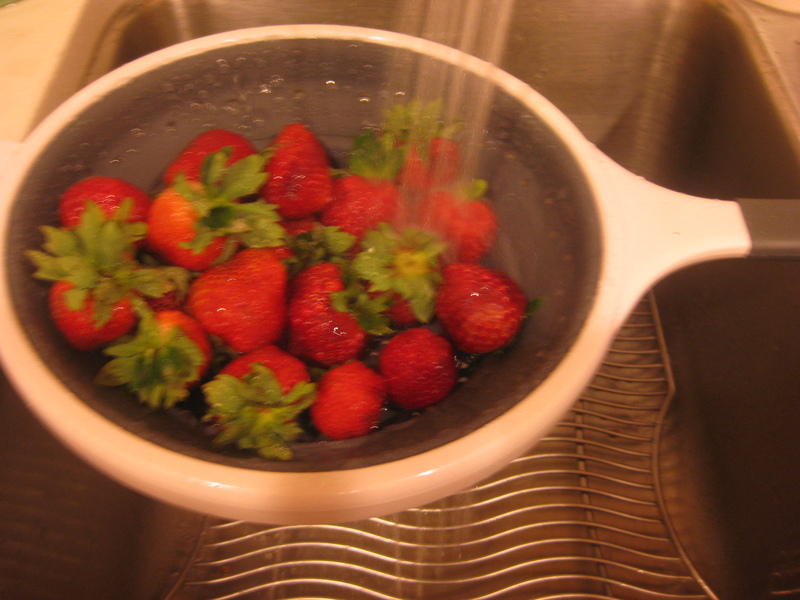 Combine the strawberries with the sugar in a glass or ceramic baking dish, stirring gently to mix well. Bake for 8 minutes or until just soft. Let cool slightly. 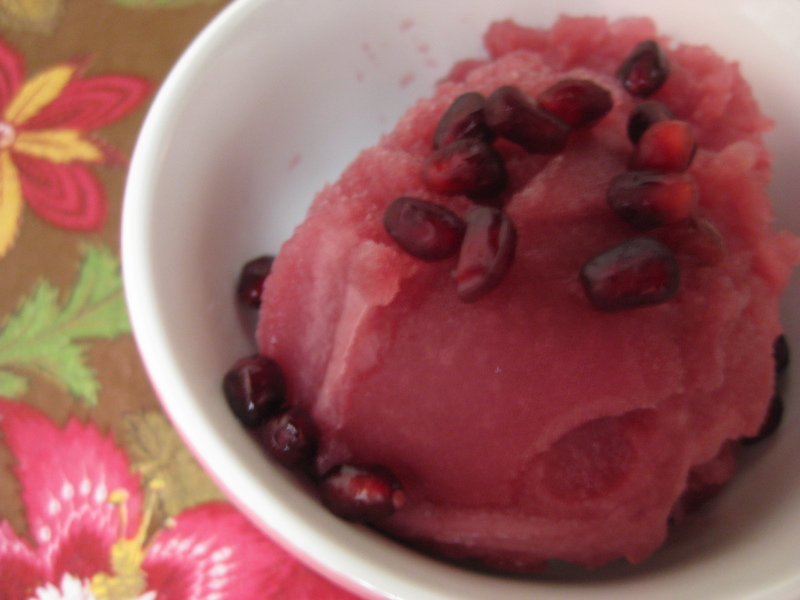 Puree the berries in a food processor with the lemon juice. Set aside. 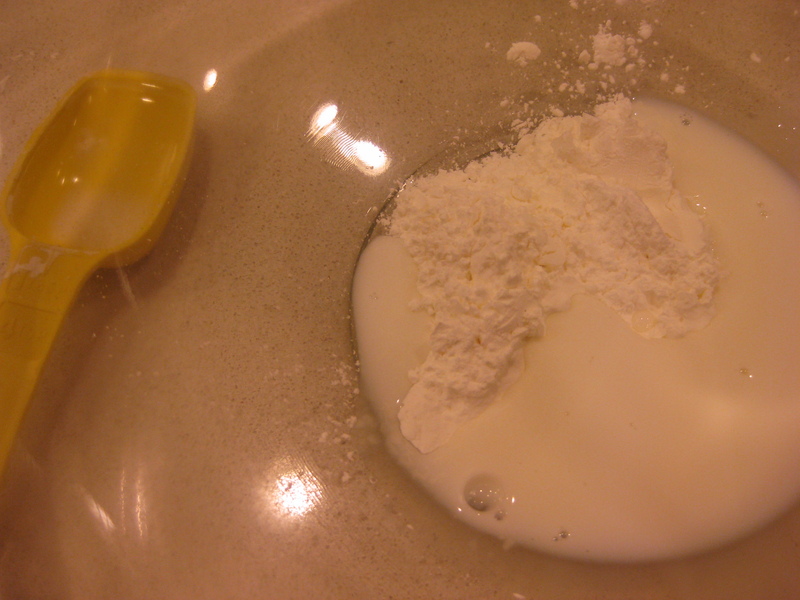 For the ice cream base: mix about 2 tbs of the milk with the cornstarch in a small bowl to make a smooth slurry. Whisk the cream cheese and salt in a medium bowl until smooth. 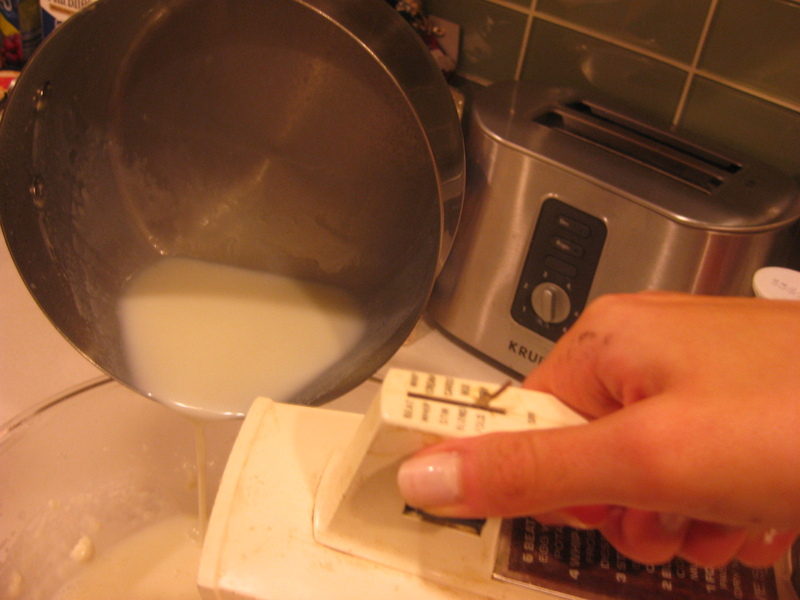 Combine the remaining milk, half-and-half, sugar and corn syrup in a saucepan, bring to a rolling boil over medium-high heat and cook, stirring with a heatproof spatula until slightly thickened, about 1 minute. Remove from the heat. In a separate heat-proof bowl gradually whisk the hot milk mixture into the cream cheese until smooth. 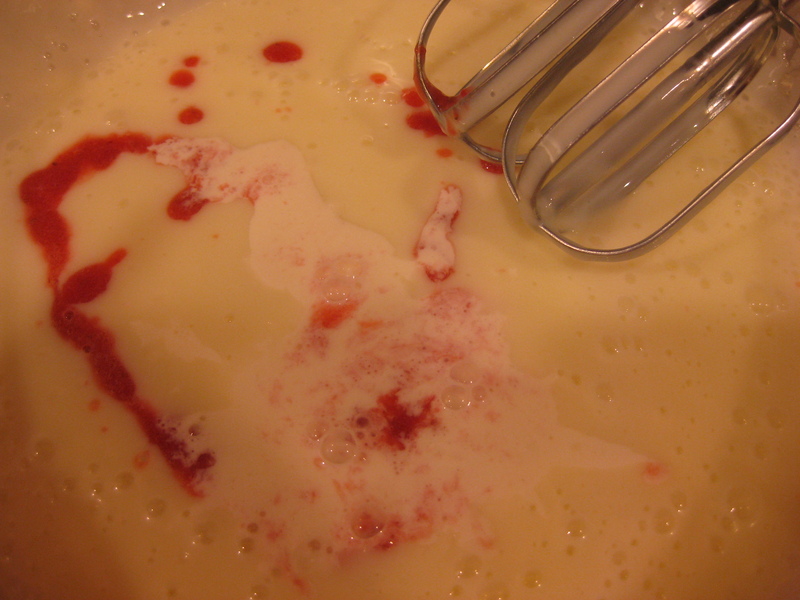 Add the strawberry puree and the remaining 1/4 cup of half-and-half and blend well. 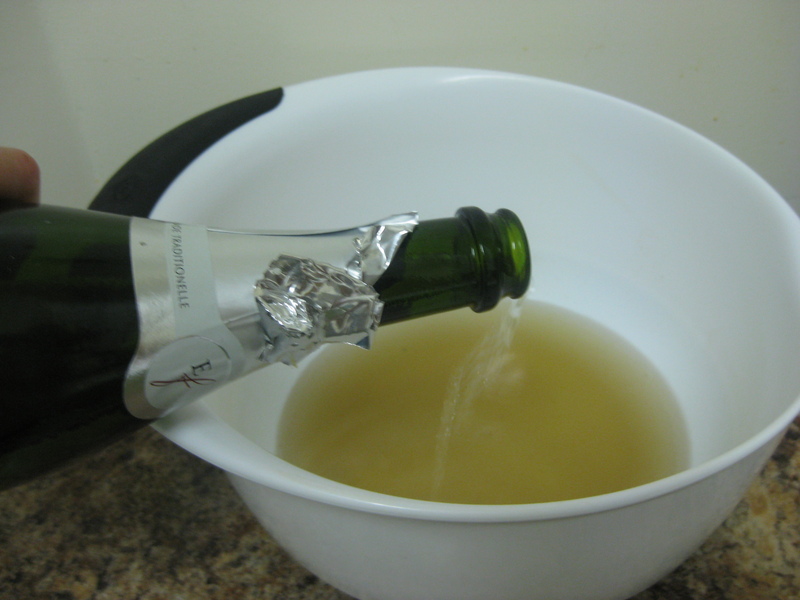 Let the mixture cool completely before refrigerating for at least 2 hours. Once chilled, pour the ice cream mixture into the canister of an ice cream maker and freeze according to the manufacturer’s instructions. Transfer into a freezer safe container and freeze in the coldest part of your freezer until firm, approximately 3-4 hours. The Verdict: Honestly I was not too impressed. 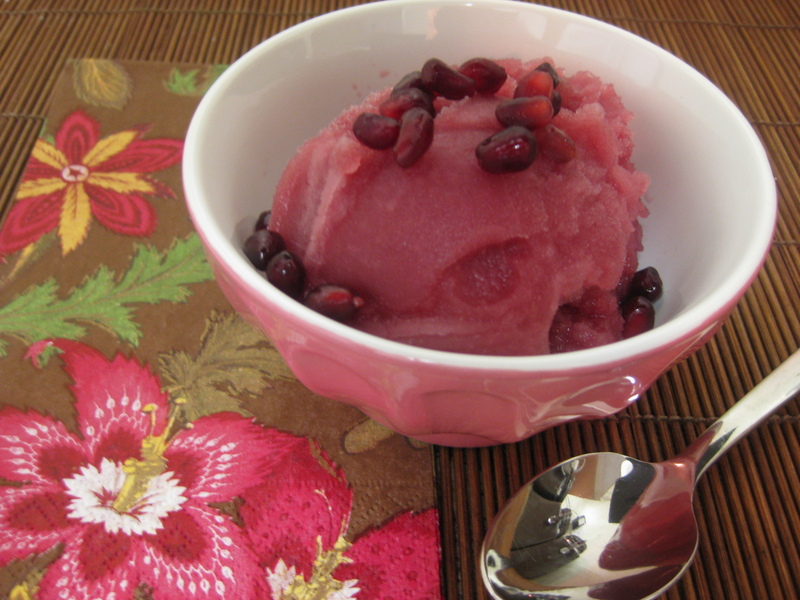 The original recipe called for 1/2 cup of pureed berries, and I used approximately 3 1/2 cups – which just goes to show that this original recipe lacked flavor. Once I added enough berries it was much tastier and when drizzled with hot fudge sauce it was simply delicious. But, being that this ice cream was not made with eggs, it got harder and icier in the freezer than a typical custard so I suggest eating it the same day. Try your hand at this flavor, but I would recommend using 3 egg yolks instead of the cornstarch, corn syrup and cream cheese (follow any of my other recipes with eggs to learn how to temper), the same proportions of everything else, and it will provide a much yummier texture. One tiny little apology – I forgot to photograph the final product. My bad. You’ll just have to imagine that it looked like this because it did! As of late, that’s become my favorite greeting. It’s weird, it’s retro, it’s fun. Last night was a big day for 365scoops – we debuted our flavors at the Real Bloggers of NYC. Not to toot my own horn (wow, another awkward expression) but it seemed that the ice cream went over swimmingly! We served over 100 cups of ice cream from 15 pints of freshly churned flavors including Tiramisu, Charleston Chew, Key Lime Pie, Peach Sorbetto, and Vanilla Bean. This morning, however, I was zonked. So zonked, that I needed a cup of caffeine – stat. For those of you who know me, I cannot drink caffeine. I become crazy, nutty, loopy and shaky (not so different from the present, non-caffeinated me). Not good things when I’m trying to work at my day job. But, alas, I had to succumb to my urges and drink coffee. In so doing, I realized that caffeinated ice was in order. After work, I marched myself home to create this very flavor. Shakers banned the consumption of coffee because they felt it was a luxury, but shortly thereafter the older members of congregations complained, so the elderly were allowed to drink coffee in the morning. Upon hearing this, the women in the community became very angry with the unfairness of the rule, so they lobbied and received the right to drink coffee the mornings of communal clothes-washing as well. SO despite their reputations of being stringent and unyielding, Shakers did sometimes show some flexibility! This happens to be a very simple (and wildly delicious recipe). I made the ice cream with caffeinated coffee (duh) but have also made versions with decaf and it tastes exactly the same and still delicious. Make the mocha sauce here and set aside. 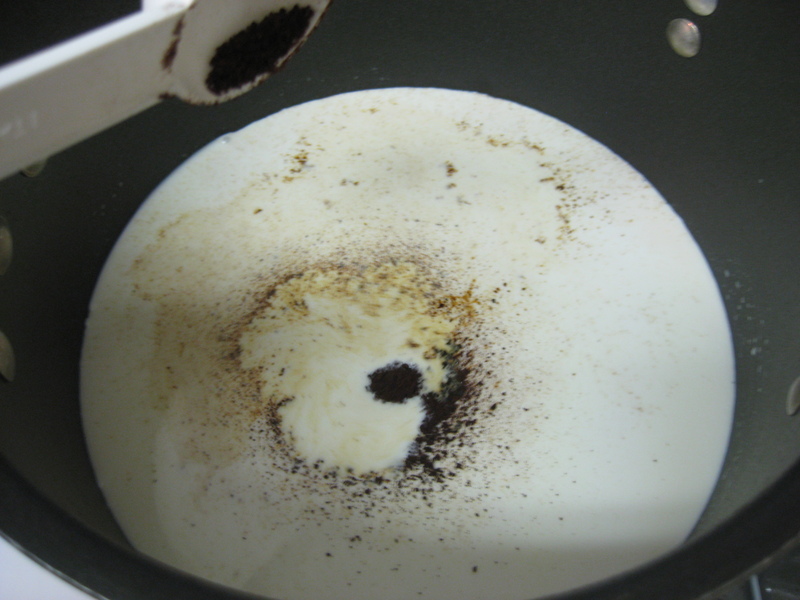 Warm the milk and half-and-half in a large pot until small bubbles form around the edges. Whisk in the cocoa and instant coffee and stir vigorously so that it dissolves. Set aside. Whisk together (I used my new fun blue whisk!) the three egg yolks. Slowly add in the sugar until it is dissolved and the yolks are pale yellow. Pour the hot coffee/chocolate mixture into the egg mixture (slowly so they don’t scramble!) and stir thoroughly. Pour the mixture back into the large pot and heat until the mixture either coats the back of a spoon, or it reaches 185 degrees. And it reaches 185 degrees. Eggs are cooked, phew! Let the mixture cool completely and then refrigerate for at least 2 hours. 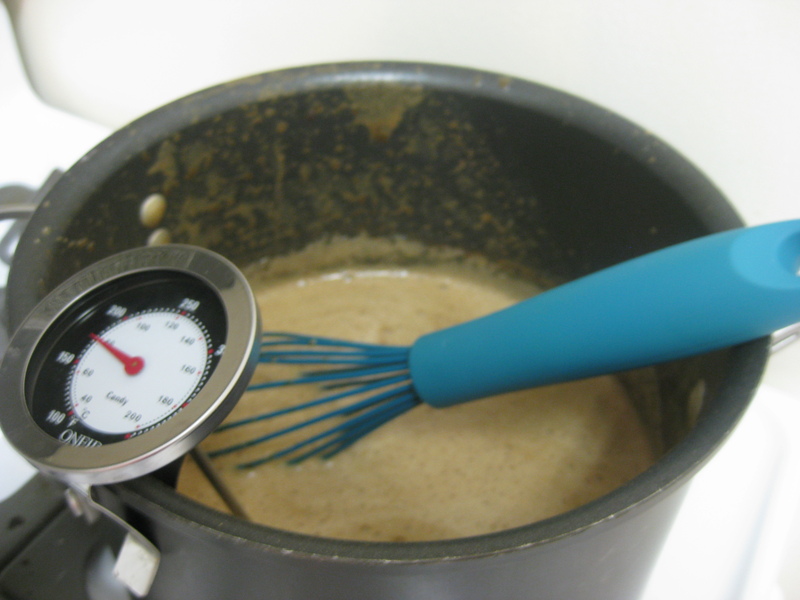 Once the mixture is cooled, pour into the base of an ice cream maker and churn according to the manufacturer’s instructions (approximately 20 minutes). 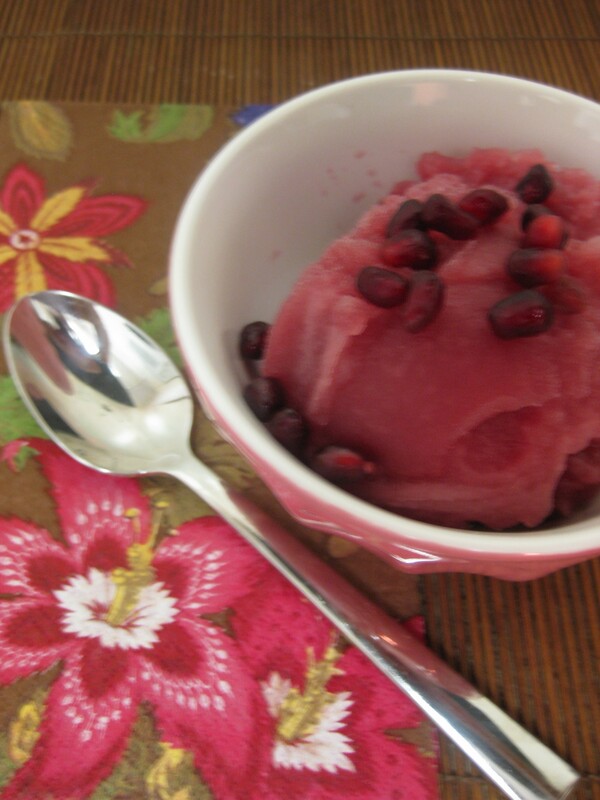 Scoop into a freezer safe container and freeze for at least 2 hours before serving. 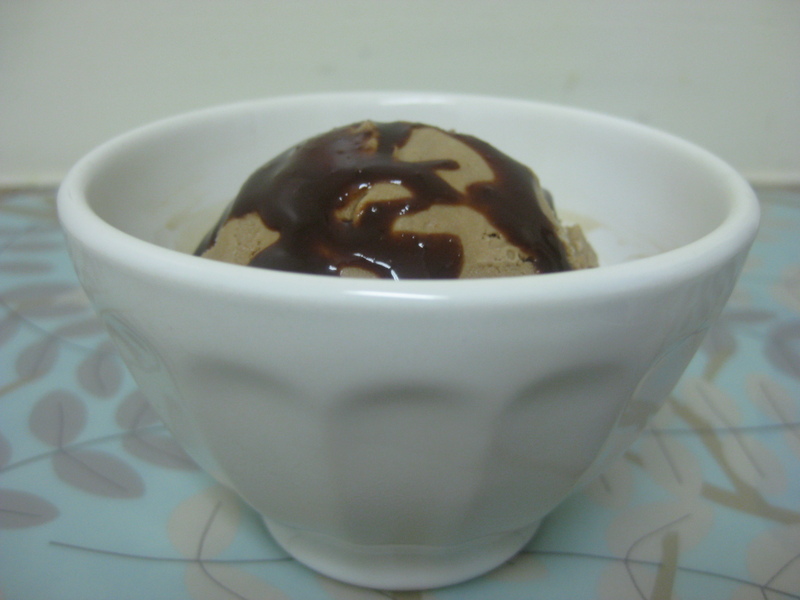 Drizzle with the mocha sauce and enjoy! The Verdict: Hit the spot. I’m sick and tired of saying “yummy” so this time I’ll say, delectable! Really, this is good stuff. I even put a scoop of it in my coffee this morning, and let me tell you, I do not regret it. A perfect, creamy addition. Enjoy!